In Ann Brashare's Latest, Two Kids From A Fractured Family Meet At Last The author behind the Sisterhood of the Traveling Pants series writes from experience — her parents divorced when she was young, and she says the divisions remain "to this day." Novelist Ann Brashares' parents divorced when she was young. "It wasn't an amicable split ..." she says, "And in some way the divisions just kept going, even to this day they do." 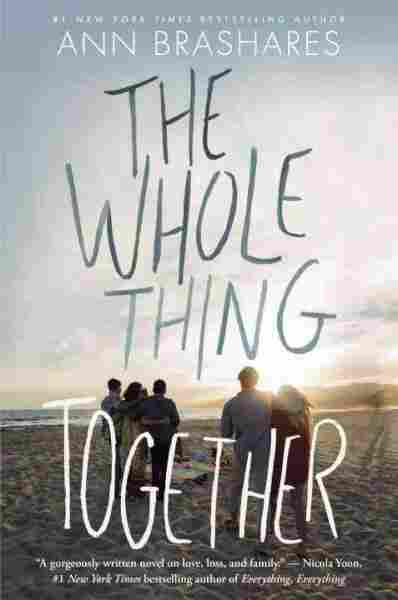 Those experiences inspired Brashares — who wrote the Sisterhood of the Traveling Pants series — to write her new novel, The Whole Thing Together. The conceit at the heart of the book is a boy and a girl — not related by blood — are part of a very un-blended family. Their parents are determined to stay angry at one another, so the kids have never met — but they occupy the same bedroom at the family's shared summer house on Long Island. Sasha and Ray spend their childhoods living in parallel, but finally meet as teenagers. Brashares says the story is entirely made up, but that she drew on her own feelings as a child of divorce. "I have two wonderful, loving parents," she says. "It's not that I bear hostility and grievance toward them. I'm mostly really, really grateful for everything I got. But the divorce was central to our lives. ... I wanted to explore that in a fictional family but explore what were real feelings." That was my entire training as a writer, nearly. I thought so much about the craft of writing and learned how to ... take a plot apart and build it back ... to think about character, and about pacing, and about all the elements, and to try to analyze as an editor: What makes a story work? What keeps your eyes on the page? What makes you feel involved in it? All in all, I just felt like it was this incredible writing education and partly it was because we weren't really so precious about any of it. We were usually working on a pretty fast schedule and so I just ended up working on hundreds, and hundreds, and thousands of pages — and I loved it. I worked as an editor for, I think, 11 years, and for many of those years ... I was wholeheartedly involved in what I was doing. But in some ways, the constraints of the popular book began to weigh on me a little bit. So, I sort of felt like when I got to do my own thing, I would really delve into the aspects I cared about most, regardless of whether it would be popular or not. And it was funny because ... I definitely didn't mean to write it as a popular book and I was incredibly happy and gratified that it turned out to be one. There's some mythic sense of them being intimately connected, and yet strangers. I pretty much made it up whole cloth. ... First I started with the three sisters at the center of the original family, and then I was imagining that the parents split up when they were really little, they each remarried, and I had this idea of each of them having another child. And then I thought, what would be the relationship of those two additional children? They have three sisters in common, in this case they share a house, but the parents have had such bitterness that they refuse to be anywhere near each other, so their paths just never cross. And yet, they share this whole life; they share these sisters, they share a room, they share toys, they share books, they share the stuff they collect on the beach. And so there's some mythic sense of them being intimately connected, and yet strangers. I had a sense that they were going to finally — the summer of this book — they were going to meet. ... They're sharing a bed, and I guess I'm so connected to the tactile quality of that ... the smells and the feelings of another person who you kind of know, but really don't know. ... That kind of can't help but have at least sensual overtones. It should be. I hope it is. There's so much energy, and so much good writing ... I feel like it naturally has to expand. ... I feel like there's sort of an old prejudice about what it is to be a young adult book, and I think a lot of those prejudices have been broken open. Radio producer Malika Gumpangkum, radio editor Barrie Hardymon and Web producer Beth Novey contributed to this story.